So let’s say you’re a Republican politician who’s been working the far right side of the political highway for years, getting little national attention other than the occasional shout-out in Human Events. Or let’s say you’re a sketchy business buccaneer with a few million smackers burning a hole in your pocket, and you’ve decided that you’d like to live in the governor’s mansion for a while, but you can’t get the local GOP to see you as anything more than a walking checkbook who funds other people's dreams. What do you do? That’s easy: Get yourself in front of the loudest parade in town by becoming a Tea Party Activist! There has been incessant discussion over the last year about the size, character, and intentions of the Tea Party rank-and-file. But, by and large, the political discussion has passed over another defining phenomenon: The beatific capacity of Tea Party membership, which enables virtually anyone with ambition to whitewash his hackishness—and transform from a has-been or huckster into an idealist on a crusade. 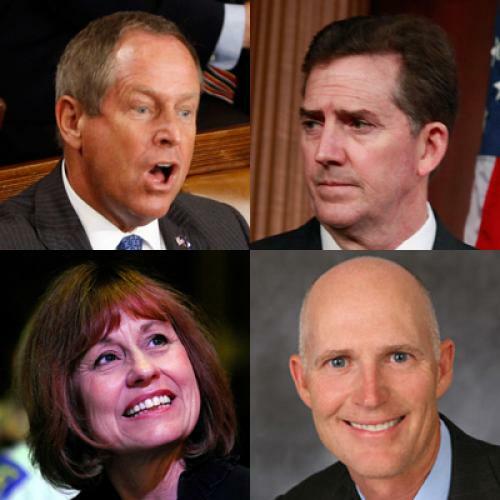 After all, to become a "Tea Party favorite" or a "Tea Party loyalist," all a politician has to do is say that he or she is one—and maybe grab an endorsement from one of many hundreds of local groups around the country. It's even possible to become indentified as the "Tea Party" candidate simply by entering a primary against a Republican who voted for TARP, the Medicare Prescription Drug bill, or No Child Left Behind. It's not like there's much upside to distancing oneself from the movement. Most Republican pols are as friendly as can be to the Tea Party; and it’s a rare, self-destructive elephant who would emulate Lindsey Graham’s dismissal of it all as a passing fad (in public at least). Here, we'll take a look at two specific types of politicians who have been especially eager to embrace the Tea Party movement: the fringier of conservative ideologues, for one, and also the self-funded ego freaks who can easily pose as “outsiders,” because no “insiders” would take them seriously. Let’s call these, respectively, the windbags and the moneybags. By “fringier” conservative ideologues, I mean those who have argued, year in and year out, sometimes for decades, that even the conservative Republican Party simply is not conservative enough. Many of these politicians would be considered washed-up and isolated, or at least eccentric, in an era when "Party Wrecking" was still treated as a cardinal GOP sin. But now it's as if they've been granted a license to kill. One classic example of this type is South Carolina Senator Jim DeMint, who was considered such a crank in the Senate that he was often stuck eating lunch alone as recently as 2008. His views, for example that Social Security and public schools are symbols of the seduction of Americans by socialism, were not long ago considered far outside the GOP mainstream. Now, in no small part because of his identification with the Tea Party Movement, DeMint has become an avenging angel roaming across the country to smite RINOs in Republican primaries, his imprimatur sought by candidates far from the Palmetto State. Then there’s the new House Tea Party Caucus, chaired by Michele Bachmann of Minnesota, best known for suggesting that House Democrats be investigated for treason. Its members include a rich assortment of long-time conservative cranks, including Steve (“Racial profiling is an important part of law enforcement”) King, Joe (“You lie!”) Wilson, Paul (“We’ve elected a Marxist to be President of the United States”) Broun, Dan (Vince Foster Was Murdered!) Burton, and Phil (National Journal’s Most Conservative House Member in 2007) Gingrey. The key here is that these are not freshly minted “outsiders”: Burton has been in Congress for 28 years, Wilson for ten, King and Gingrey for eight. The oldest member of the House, Ralph Hall of Texas, who has been around for 30 years, is also a member of the caucus. Pushed out of his job after the fraud decision, Scott decided to found the Conservatives for Patients’ Rights (CPR) group that exploded onto the national scene early in 2009 with a series of inflammatory TV ads attacking health reform, employing the same firm that crafted the Swiftboat Veterans for Truth spots against John Kerry in 2004. CPR also played a major role in organizing the town hall meeting protests in the summer of 2009, which marked the Tea Party movement's transition from a focus on TARP and the economic stimulus bill to a broader conservative agenda. So when Scott (a Missouri native who moved to Florida in 2003) suddenly jumped into the Florda governor’s race early in 2010, the cleansing power of tea had already transformed his image among conservatives, making his improbable campaign possible. On the wrong side of this dynamic was Florida Attorney General Bill McCollum, a former congressman and sturdy, if conventional, conservative who had paid his dues by twice running unsuccessfully for the Senate. McCollum had apparently all but locked up the nomination when Scott, in mid-April, leapt into the ring with ads calling himself a “conservative outsider” who would “run our state like a business,” while tarring McCollum as the candidate of “Tallahassee insiders” responsible for “the failed policies of the past.” Then came a torrent of advertising from Scott ($22 million by mid-July, more than anyone’s ever spent in Florida in an entire primary/general-election cycle) blasting McCollum for alleged corruption, for insufficient hostility toward illegal immigration, for being soft on abortion providers. The assault voided a lifetime of McCollum's toil in the party vineyards, vaulting the previously unknown Scott into the lead in polls by early June. Worse yet, from a Republican point of view, Scott drove up McCollum’s negatives, and increasingly his own, to toxic levels, handing Democrat Alex Sink the lead in a July general election poll. And now McCollum, fighting for his life, is striking back, drawing as much publicity as he can to Scott’s questionable past, especially the Medicare fraud case against Columbia-HCA. So the question is: Would Rick Scott have been in a position to carry out what is beginning to look like a murder-suicide pact on the GOP’s gubernatorial prospects if he hadn’t been able to identify himself as an “outsider conservative” with close ties to the Tea Party? That’s not likely, but it’s no less likely than the remarkable epiphanies that have made career pols of marginal relevance such as Jim DeMint and Sharron Angle into apostles of an exciting new citizens' movement. So the next time you hear a candidate posturing on behalf of the Tea Party, squint and try to imagine what they were like in their former lives. Many of them have only found respectability through the healing power of tea.